Philadelphia police are seeking help identifying these two suspects, who are accused of robbing a Frankford store and beating an employee who was serving water ice there. Philadelphia police are seeking two suspects accused of beating the clerk of a corner store as he scooped water ice during a brazen, violent robbery. 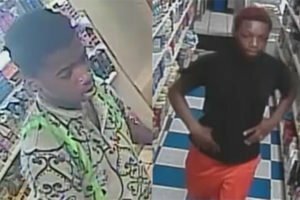 According to police, two black males entered a corner grocery store on the 1300 block of Unity Street in the Frankford neighborhood around 7:30 p.m. on July 23. The suspects, both described as being between 15 and 20 years old, asked for water ice, and as the 20-year-old male employee began scooping the treats, police said one of them struck the clerk several times with brass knuckles. Police said the suspects can be seen on surveillance video passing brass knuckles — and what officials said they believe is a handgun — between one another. After the suspects allegedly forced the clerk to the ground, law enforcement officials said the two stole an undetermined amount of cash before fleeing west on Unity Street. Police said that the first suspect has been described as standing about 5 feet 8 inches tall and was unshaven and wearing a blue-and-white shirt with green stripes down the back, light blue shorts and black sneakers. Police alleged this suspect had brass knuckles. The suspect police said they believe was armed with a handgun was described as being about 5 feet 6 inches tall, had orange and red hair and was wearing a black shirt and orange shorts. Anyone with information should call Philadelphia police at 215-686-8477 or text a tip to 773847. Also, tips can be sent anonymously to police here.